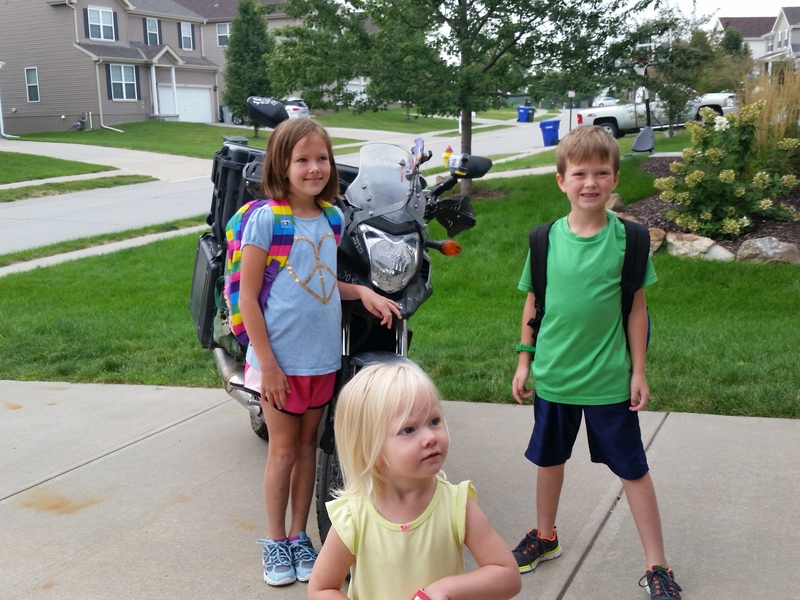 Our journey restarts with a mixed bag as we roll east. I still had quite a bit to do, but knew that it was my departure day regardless of my preparedness. I completed my digital work in the morning, then set about packing up Annie. My packing list is nearly unchanged from my first departure. 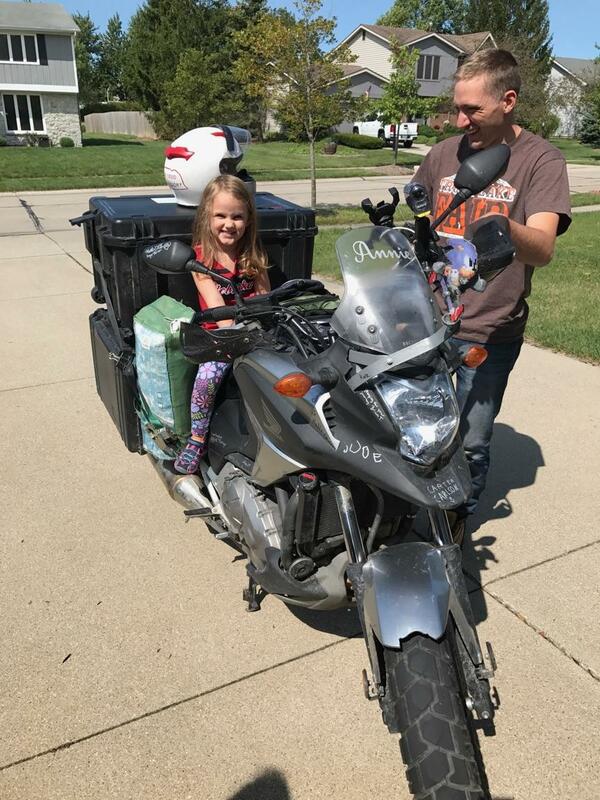 The only major additions are a pot and stove and a hydration backpack. A few odds and ends were left at home (including my awesome quilt 😦 ) as well as some clothing. 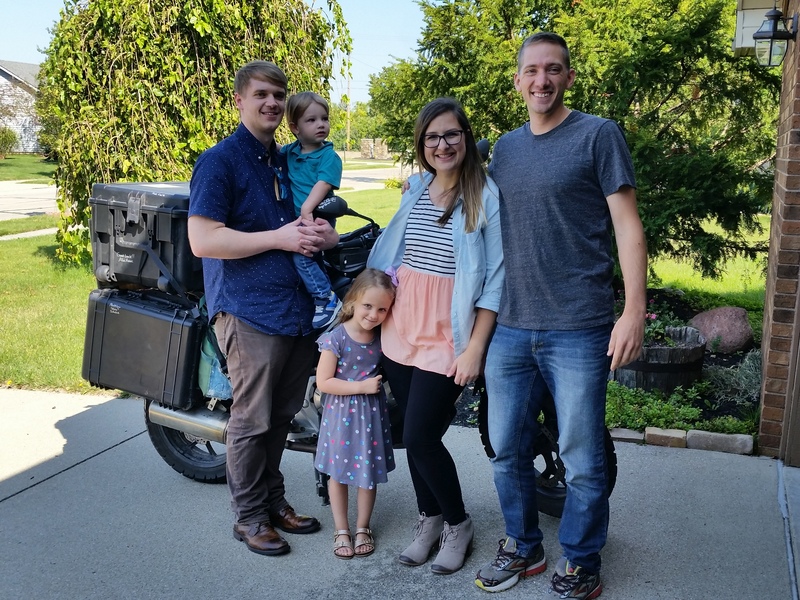 Grant and Sarah have four kids, ranging from nearly 9 to nearly 1. In terms of unpredictable adventures and daily pandemoneum, they have me beat easily. Though brief, it was nice to have some time with them. Before Rose and Calvin took off for school, they signed Annie. At one point, I captured three of them in the same picture. I think this is quite an achievement. 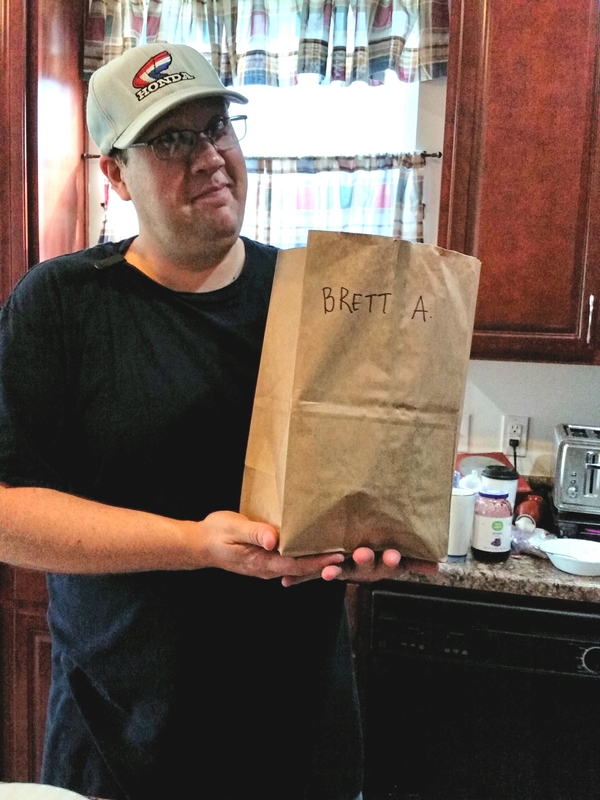 I lingered through a second cup of coffee and my brother packed me a bag lunch. I knew I had a long day ahead of me, but I was not too concerned about time. My plan for the night was to make it to a friend’s house in Ft. Wayne, IN. Well, sometimes plans have to change. I-80 across Iowa was in great condition, perhaps the best I have ever seen it. Everybody knows the windmill blade rest stop, right? I felt a bit silly as I blew past Davenport (Verse 3 Line 4). I would be skipping it as well as the other two remaining Iowa stops (Waterloo and Oskaloosa), opting to visit them on the return portion of this loop. Sorry, #Iowa , to rush through you. I'll be back for Davenport, Waterloo and Oskaloosa at the end of this loop! I have tried to be a bastion of positivity throughought the reporting of this trip so far. I do strive for honesty and transparency, but tend to frame things in the best possible light. That’s just my nature. That said, I think I have regurgitated enough sunshine that I have earned the right to rant a bit. Has anyone ever had a good experience driving between Joliet, IL and Gary, IN? This is possibly the worst non-coastal place to drive in the US. Maybe there is no way that the convergence of I-80 and I-90 just south of the largest city in the middle of the country can go well. I just wish there was a feasible option for bypassing this bottleneck to the south. Traffic creeped along, apparently due to an accident. I can’t say for sure that it was due to an overaggressive Illinois driver, but this seems like the most logical hypothesis. Google suggested leaving the interstate and I decided to take the suggestion. Instead of creeping along the interstate, I was now creeping through urban sprawl. An upgrade? Hard to say. I crossed the border into Indiana. I’ve always thought the Indiana tollway (Indiana’s non-gratis stretch of I-80) is a little ridiculous, but I was running short of time and decided it was worth paying the toll. I only had 31 miles to travel on the tollway, so I would just hop on and off of it in a hurry. This ended up being a terrible decision. The line for paying the initial toll moved at the pace of a geriatric sloth. Indiana has made the dubious decision to replace its toll collecting employees with machines, which seems like a good idea in theory. In practice, not so much. I sat for 25 minutes just waiting for my turn to insert $1.80 in the machine. Two additional toll stations cost me about 15 more minutes. As much as I loather their tollway, the people of Indiana are a real treat. Every stop for gas or other supplies was met with interested questions about my trip and sincere encouragement. Indianans seem kind of like Nebraskans, just maybe more outgoing and more addicted to basketball. I limped off of the tollway near Valparaiso, IN, my endurance thouroughly sapped by frustration. It was dark and there were numerous signs warning for deer. I was over two hours behind where I thought I would be. If I continued on, I would not reach my friend’s place until after 11pm. I may be a boorish guest, but this is pushing it, even for me. It was time to shut it down for the night. Additionally, I had somehow acquired the “motorcycle shivers.” I’m not sure if this is a real thing or not, but it happens to me sometimes. Though the temperature was still in the upper 50s, I had allowed myself to get cold earlier on. Once cold on a bike, it is nearly impossible to get “uncold” until stopping. When I get this way, my nose runs almost constantly. This torrent is difficult to manage beneath a full face helmet. I struggled to find an appropriate spot to pitch my tent, probably scouting around for almost an hour. Since it was a weekend night, I wanted to be more selective about my choice. I found a less than ideal spot at some soccer fields on the south side of town. Sleep was difficult both to maintain and achieve. Perhaps this was understandable, considering it had been about three weeks since my last roofless night. Multiple times I awoke with my heart racing, feeling like there was someone right outside of my tent. I woke up at sunrise, trying to be packed up before any events would start on the fields. I ate a small breakfast before completing the ride to Ft. Wayne. This is the home of my childhood friend, Austin, and his family. He moved away from Nebraska in 1999 and I said I would come visit him in Indiana (in 18 years at the most). Better late than never! His daughter, Hollis, was wearing a Nebraska Cornhuskers cheerleader outfit when I arrived. It is always great to see children being raised right. We had a fun day gallivanting about town. Ft Wayne is similar in size and feel to my home of Lincoln, NE. Not too big and not too small. 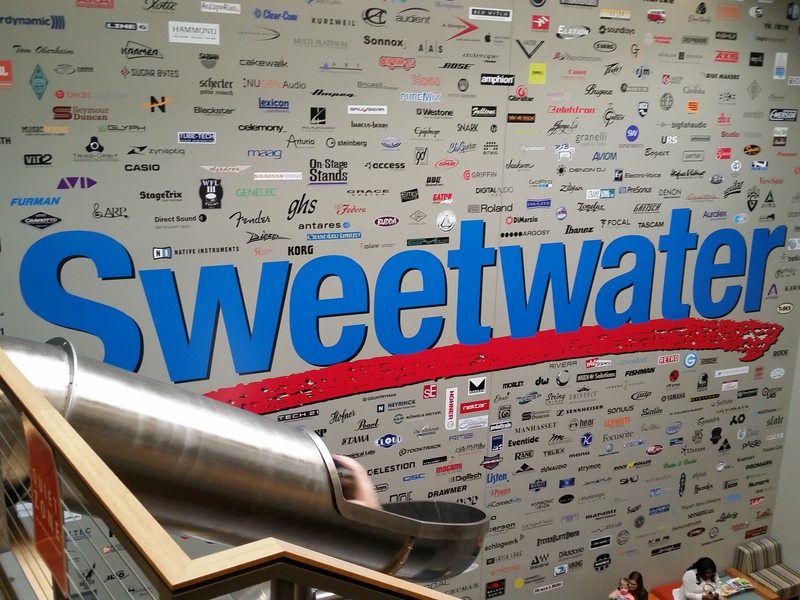 One of my favorite stops was the company headquarters of Sweetwater. They are a music supply company. I remember buying some strings for my 12-string guitar from them. About a month after my purchase, I received a call from them just asking how the strings were working out. What is this? 1963? Nobody has customer service like that. Their commitment to goodness extends to their headquarters. They are open to the public and have lots of fun activities: Tables for ping-pong and pool, arcade games at no charge and a huge slide. Back at home it was time to cheer on the Huskers for their first game of the year. I am a big sports fan, but it is going to be difficult to catch each game of my favorite teams this year (Huskers, Chiefs and Tottenham Hotspur). It will be a real treat when it works out to view a game, especially for free! Another Sunday, another church. I now have a different “church shirt” than I did on my first leg. Don’t be alarmed, it’s still me. Austin and Steph attend a church called The River which is close to where they live. I made a pot of Swedish egg coffee for them, probably one of my best of the trip. I can’t offer much to those who host me, except for an exotic caffein experience and stories about skinny-dipping. Church was great and I met some friendly people there. Afterwards, it was time to take care of some business: Pictures and bike signing. After lunch it was time for me to go. It was so wonderful to be able to connect with them. I doubt it will take me 18 years to come back again! I proceeded east through the NW corner of Ohio. The first time I have been in the the Buckeye State on this trip. I’ll be back to see Dayton at the end of this loop. It’s a shame Napoleon, OH isn’t in the song. I entered Michigan and scooted along the section of mitten beneath the thumb. I spent about 90 minutes scouting for a camping spot. Eventually I ended up on Grosse Ile, the largest island in the Detroit river. I got a little lost and ended up finding this wilderness trail that was just wide enough to stake my tent. It was a perfect spot. I celebrated by using my stove for the first time (thanks, Uncle Dan! ), cooking up a meal in a bag (thanks, Cousin Abi!). I have to confess, it was kind of nice. …and we’re off….again. A few bumps in the road, but that’s to be expected. The good greatly outweighs the bad! Real-time update: At a Tim Horton’s just south of Toronto. I’ll check that out today, then Faraday, Kingston and Ottawa. Then it will be time to head north to Schefferville! Love the picture of Grant with your lunch! What a nice big brother! 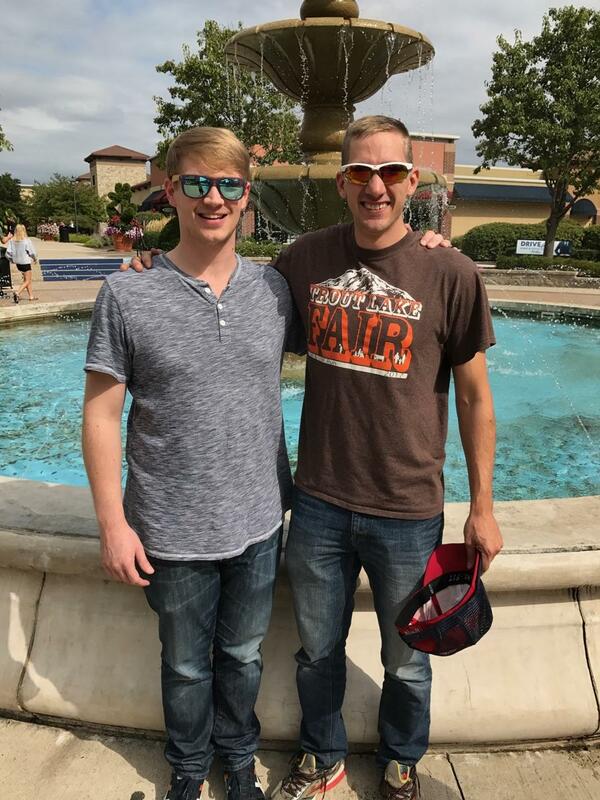 It’s wonderful to have lifetime friends like Austin! Yes, I’ve been blessed in many ways. It was nice Grant labeled it so it wouldn’t get mixed up with the other kids at school. Just have leave a comment to tell you how much I am enjoying this journey, vicariously, while rehabbing after 2 knee replacements. Just alerting you on cold weather–NW NE expecting 32 degrees overnight tonight. Did you pack your thin skins? Wow. This is a “Dad” comment if there ever was one. 🙂 I have no plans to invade Russia in the winter anytime soon. However, Schefferville must fall! I knew I was going to hear about that!